GG3 claims a three-fold improvement in scratch resistance, 40 percent reduction in the number of visible scratches and 50 percent boost in retained strength after the glass becomes flawed. 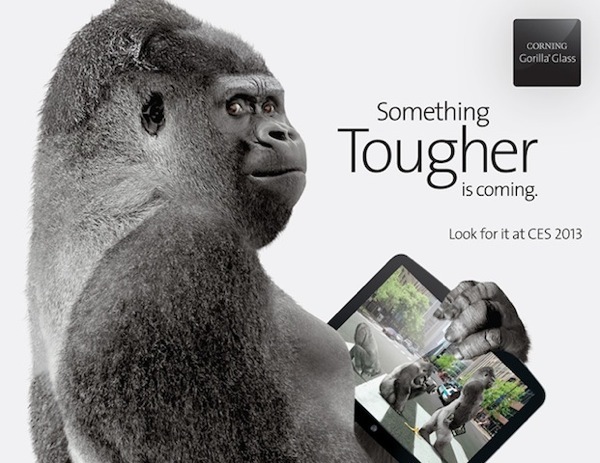 Once CES 2013 launches, expect some hands-on videos of Gorilla Glass 3 from the Corning booth, like we saw last year with Gorilla Glass 2. The Kentucky-based company’s glass technology played an important part as Steve Jobs called upon them to create a new product for the original iPhone. John Seeley Brown was Jobs’ friend and on the Corning Glass board. He told Steve to call up Corning CEO Wendell Weeks to see what he could do for Apple. It wasn’t until March of last year did Apple admit publicly Corning Gorilla Glass was used in the iPhone.